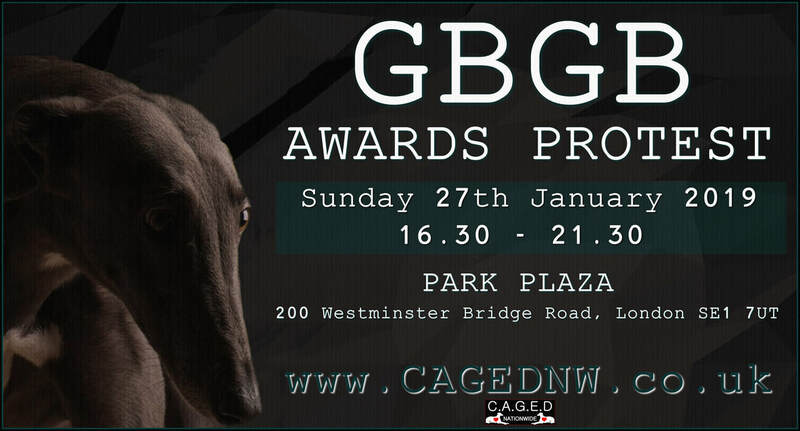 The official date and venue for the Greyhound Board of Great Britain (GBGB) awards gala has been released. Looks like the Greyhound Board of Great Britain have had to find yet another venue to congratulate themselves for exploiting greyhounds throughout the year & we will be right there to hold them to account. Once again the venue is at the Park Plaza. 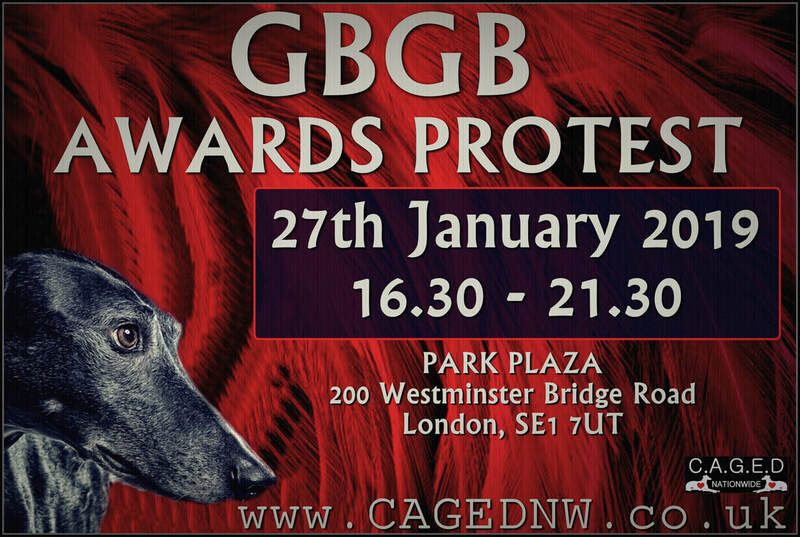 CAGED Nationwide, are hoping you join us once again for the annual GBGB awards protest. Please read the protest guidelines in full before attending. Please note that every individual shall be responsible for their own actions at this event and Caged Nationwide will not be responsible for the actions of others. For the safety of all protesters, some filming will be in process throughout the protest. People are welcome to wear GoPros or other visible body cameras for their own protection. All events held previously over 6 years have been peaceful. 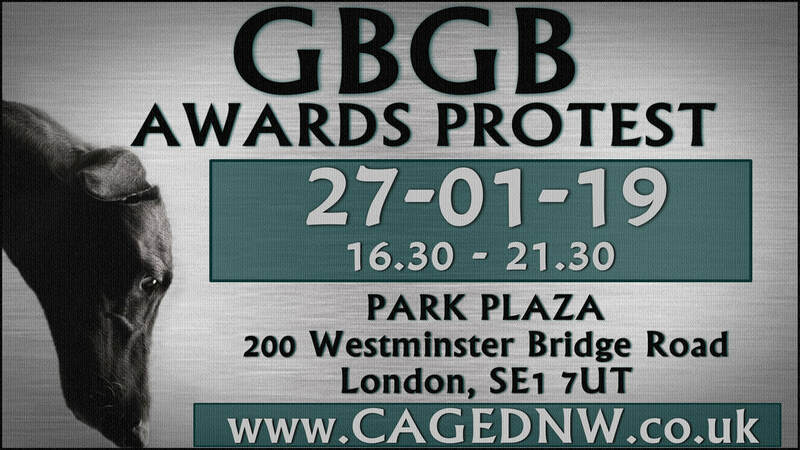 We ask that people read the Caged Protest Guidelines in full prior to attending. Police are usually present at these events and will be notified of this particular event in advance. We know you will agree that it's vital to portray a strong message about greyhound racing to the public. You are of course welcome to bring your own placards or banners, but we ask that the main content carries images or text concerning greyhound abuse and that logos or names are displayed secondary to this. You are also welcome to bring your own leaflets and fliers too. Caged Stewards will be wearing yellow hi visibility coats and will assist wherever possible. Please do try to comply with any polite requests made by the stewards as they will only be working to keep protesters safe. In the rare event of anyone becoming injured or unwell, a Caged Medic will be available to assist. If you cannot see the Medic, please ask one of the Stewards to phone through.